Impressively run, this massive interactive visual playground spanning two floors will have you laughing out loud from the moment you enter to the moment you leave. Inside are 9 themed zones where walls and floors have been meticulously hand-painted by talented South Korean artists to create stunning optical illusions that trick the eyes into thinking you are in the scene. First up is ‘World’. Here, three-dimensional paintings range from skyscrapers jutting from the wall that flatten as you pass to Time Magazine’s front page beckoning you to step in and be featured. The range is truly eclectic and while the London Beefeater, Grecian statues and old-style window displays deserve their ‘World’ inclusion we really struggled with the ’iconic’ status of the ceiling-to-floor, half-eaten apple core. But what the heck, the tone had been set and the fun had begun. And it was fun – lots of it as zone after zone offered more and more eye-bending delights. There are over 130 individual art pieces throughout the zones so if becoming a mermaid on a rock in Aqua Zone doesn’t suit you then try escaping over molten lava while chased by a dinosaur smashing through rocks or, if you really want to challenge your optics, get your head served up on a platter in ‘Imagine’. We thought we knew what to expect from ‘Art in Paradise Danang: we’d seen the pictures. However, we never expected to enjoy ourselves as much as we did. 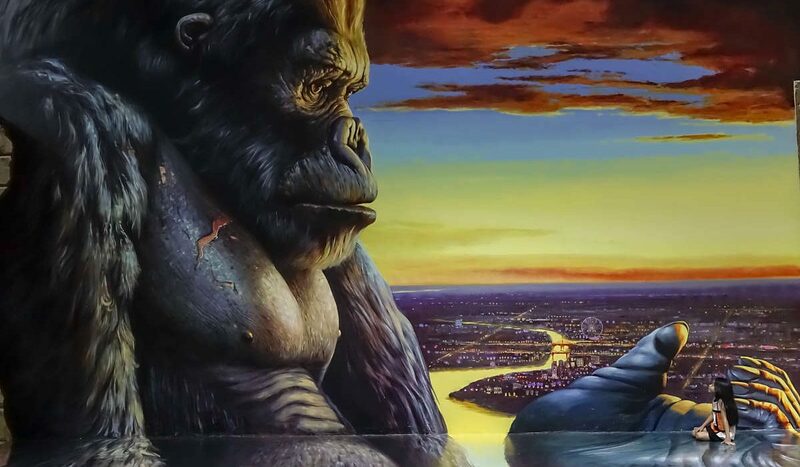 While some of the 3D art is just ‘good’ much of it is simply incredible and there are enough different optical ‘tricks’ to keep each section alive and interesting. 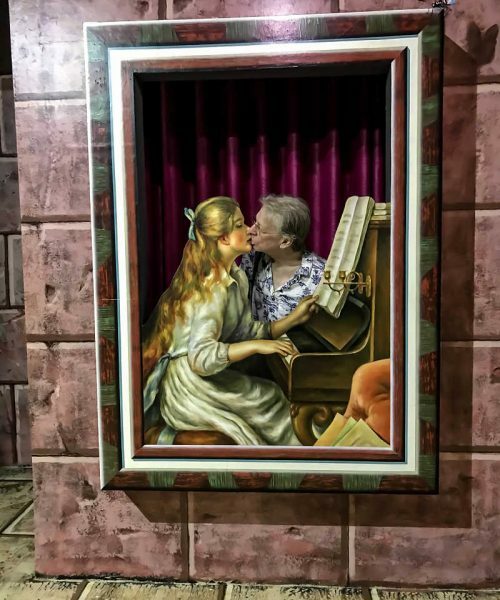 Our eight-year-old thought being a fairy in fairyland was ‘the best thing ever’, Stuart, Hoi An Now’s General Manager, thought all his Christmases had come at once when he got to step inside a painting and kiss a voluptuous, rosy-cheeked maid at the piano. For me? 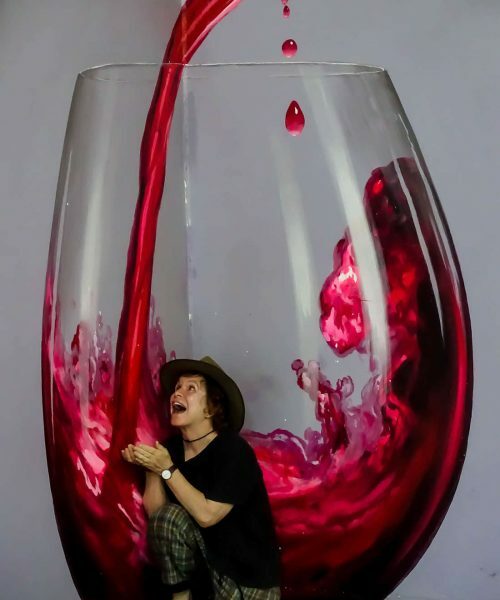 Well there was one total stand out, and something that even surpassed the entire wall King Kong painting – sitting inside a giant wine glass while a torrent of free-flowing wine poured straight into my gob! To heck with the ‘finding things to do for kids’: I love this place and I wanna go back! It takes around two or three hours to cover all nine zones depending on how long it takes to perfect your perfect pose and how many in your group. You can also go back and forth between the Zones. How Do I Know Where to Stand in the Picture? Apart from a series of photo suggestions at each zone, there are large arrows by each station not only indicating where to stand but also where to pose to get the optimum image. How Far Is It From Hoi An and How Do We Get There? It’s around 40 minutes by car to get to ‘Art in Paradise’ from Hoi An. We recommend you hire a private car and driver to pick you up from your hotel and take you back when you are finished. 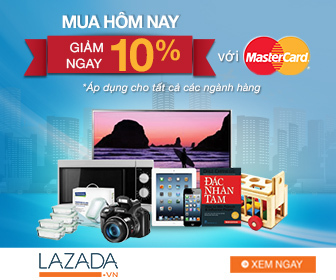 It costs around 500,000vnd for the round trip and includes waiting time. ‘Art in Paradise Danang 3D Museum’ is aimed specifically at Korean tourists – that’s if the three busloads of Korean tourists and café that serves only Korean food is anything to go by. If you do encounter droves of tourists arriving at the same time – as we did – order a quick refreshment in the café. Their yoghurt blends are worth the detour and by the time we got inside, around 15 minutes later, the place was empty. And if you can’t escape the crowds, don’t worry, there is plenty of elbow room in the gallery anyway. Not at this stage. Even though so many tourists turned up ahead of us we had no trouble getting in.